Mèze is the oldest town in the bassin de thau. Successively iberian, phoenician, greek, and then roman, it was built around its port, well sheltered from the lagoon’s whims. 3 kms from the sea, the area of Vic-la Gardiole alone sums up all the landscapes of the bassin de thau. Built on a small hill at the north-east tip of the bassin de thau, Balaruc-le-Vieux backs onto the massif de la gardiole and overlooks the lagoon. 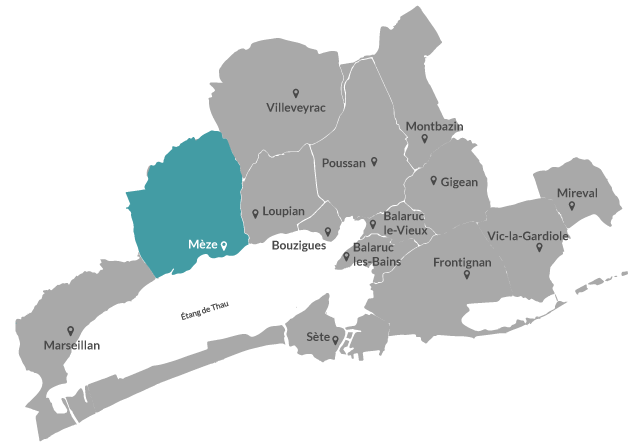 Mireval is a privileged place, protected to the north by the massif de la gardiole and bordered to the south by the étang de Vic. Bordered by the massif de la gardiole and a vast wine-growing plain stretching from the moure hills to Montpellier, Gigean is a strategic crossroads in the heart of the region. Built on the via domitia by the romans, and ideally situated on the axis between Provence and Narbonne, this village on the edge of the scrubland is a former stopover point. Located on the Via Domitia route and with a wealth of remains from several galloroman villas, the area of Poussan has been continuously occupied since ancient times it prospered in the middle ages. Villeveyrac in the heart of a vineyard surrounded by scrubland, this village flourishes in an environment perfect for walks and hikes. Loupian has an exceptional historical heritage, roman and middle age, a past spanning two thousand years. Home to the oysters of Bouzigues since 1925, and a listed site, this small and charming typically mediterranean fishing village has kept its charm of the past. The omnipresence of water, its incomparable light and colours are all qualities which have earned Sète the name "Venice of Occitany"
The entrance to the Canal du Midi, a village settled between the sea and the Thau lagoon. Shellfish farming, wine production, Noilly Prat's cellars.